You may not yet have considered the notion that companies for which systems of values really matter -- we frequently refer to them as values-centric -- often possess the attractive capability of playing a role in building a brighter America. Taking a closer look at this concept, perhaps nowhere does it become more of a literal truism than with Lowe's Companies (LOW). The huge North Carolina-based purveyor of a wide range of home improvement items and materials across the North American continent is truly benefitting our great nation. You see, separate and apart from their daily functions at the company, an impressive number of Lowe's employees volunteer their time to help foster the efforts of the well-known Habitat for Humanity. That organization, which is sometimes referred to simply as Habitat, has, since its formation in 1976, been devoted to building "simple, decent and affordable" housing as the crux of what it terms a "Christian housing ministry." Much of the impetus for the volunteerism that's so crucial to Habitat's success emanates from Lowe's. Indeed, the company's crucial role in the charity's efforts reached a high point during the first week in May of this year. In what was termed National Women Build Week, a whopping 17,000 women, including "Lowe's Heroes" employee volunteers, contributed their efforts in the construction or repair of housing in fully 300 Habitat locations. As the company has noted, the combined goal of Lowe's and Habitat was to provide safe, stable housing for as many as 1,000 families. To a large extent, this was the perpetuation of an expanding tradition, since Lowe's partnership with Habitat began in 2003. And since that time, it has helped to kick off Habitat's first National Women Build Week (2008) and funded the organization's efforts to the tune of an impressive $63 million. In part through that generosity, 5,500 Habitat families are living amid vastly improved conditions. By now, especially if you're a woman, you're probably wondering how thousands from the distaff side could possibly possess the appropriate skills to meaningfully contribute to a week of home construction. If you're beset by that reasonable query, here's a pretty good one-word response: Lowe's. As Erin Sellman, the corporation's senior vice president of strategy, insights, and planning has been quoted, "Throughout the week, Lowe's and Habitat for Humanity teach the women volunteers the necessary construction skills through how-to clinics and empower them to use those new skills while working alongside Habitat families." Lest you assume, however, that its work with Habitat represents the only arrow in Lowe's values quiver, consider this: The company is also noteworthy for another charitable foundation, "Lowe's Toolbox for Education." That foundation's two key and related objectives are the fostering of increased involvement among parents in their children's education, along with the provision of grants to parent groups to help improve their children's schools. 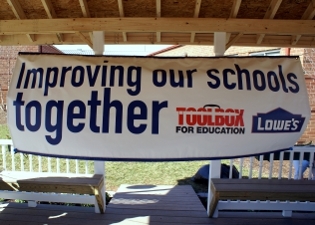 Since 2006, in a program that also involves volunteerism in bettering school buildings, Toolbox has donated about $18 million to improve nearly 4,000 K-12 public schools. As has been noted in the corporation's literature, "From classrooms to libraries to playgrounds, the projects have reached every corner of schools throughout North America." In yet another supremely patriotic effort, Lowe's Companies has long made a concerted effort to hire military veterans, reservists, and military spouses into its corporate family. Today, the number of veterans building careers across the organization tops 13,000. After all, as management has noted, "The military instills leadership, a strong work ethic, and a passion for a job well done, a testament to the Power of We." It's probably not a wild wager to speculate that you've been through the doors of at least one of Lowe's approximately 1,650 stores, perhaps recently. If so, you won't be surprised that the company, in addition to the values-driven aspects of its business, is one awfully high-quality commercial enterprise. With annual revenues of about $60 billion and an enterprise value of nearly $75 billion, it's a member in good standing of Fortune's hierarchy of the top 50 U.S. corporations, based on revenues. And those investors who've partaken of its stock availability are hardly disconsolate: In the past year, Lowe's share price has risen nearly 22%, and its five-year leap has constituted almost 270%. In summary, in any quest for companies that are unwavering in their adherence to strong sets of values, Lowe's Companies is hard to beat. Its efforts on behalf of Habitat for Humanity, the nation's education system, and our veterans -- among numerous other causes -- are about as patriotic a combination as you'll find. What other corporate triumvirate could possibly stand taller in the building of a brighter America?